I thought I’d do a quick post as a reaction to yesterday’s terrible events in London in which four people lost their lives and several are still critically injured. We now know that the attacker was British and that he was known to the intelligence services. He appears to have acted alone and was armed with knives and drove an ordinary car onto the pavement, hitting a number of people before crashing the car and managing to stab a police officer to death before he was himself shot and killed. Whatever his motivations were, it looks more likely on the basis of information currently available that these were the actions of a crazed individual than part of an international terrorist conspiracy. We should, however, avoid jumping to conclusions and wait for the investigation to be completed. The first thing I want to do is to express my condolences to the families and friends of those who lost their lives. My thoughts are also with those who were critically injured and I hope with all my heart that they will all recover speedily and completely. Physical healing will take time, but they will need help, support and time to come to terms with the mental trauma too. The same is true for those who were caught up in this attack and received minor injuries or even just witnessed what happened, because they must have been shocked by the experience. I hope they receive all the help they need at what must be a very difficult time. The second point is that it’s clear that the police and other emergency services acted with great courage and professionalism yesterday. One policeman sadly died, but the swift actions of his colleagues prevented further loss of life. Ambulances, paramedics and members of the public all responded magnificently to care for those injured, and we shall probably find that their response saved many lives too. They deserve all our thanks. Finally, I noticed a number of ill-informed comments on Twitter from the usual gang of Far-Right hate-mongers, especially professional troll Katie Hopkins, claiming that London was “cowed” and “afraid” because this attack. I don’t believe that for one minute, and I want to explain why. Anyway, my point is that amid these awful terrorist atrocities of the 1990s, people were not “cowed” or “afraid”. Londoners are made of sterner stuff than that. It is true that one’s immediate response when confronted with, e.g. , a bomb explosion is to be a bit rattled. I’m sure that was true for many Londoners yesterday. That soon gives way to a determination to get on with your life and not let the bastards win. The events of the 1990s gave us a London of road blocks, security barriers and many other irritating inconveniences, but they did not bring the city to a standstill, as some have suggested happened yesterday. For the most part it was “business as usual”. 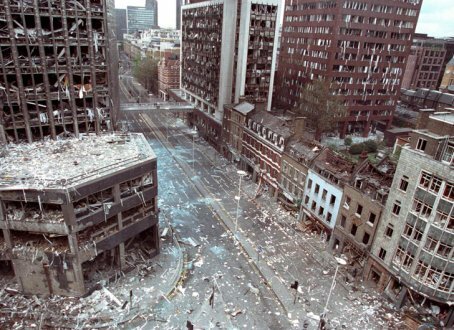 I don’t live in London anymore, but I think Londoners are as unlikely to be frightened today as they were back then. And it will take much more than one man to “shut down the city”. As a matter of fact, I think only a coward would suggest otherwise. This entry was posted on March 23, 2017 at 4:12 pm and is filed under Biographical with tags Aldwych, Bishopsgate, London, Westminster Bridge. You can follow any responses to this entry through the RSS 2.0 feed. You can leave a response, or trackback from your own site. I heard the explosion of the Harrods bomb from Oxford Street in December 1983. The bomb killed six people. I was in Harrods a half hour or so before that bomb doing some Christmas shopping. I’d completely forgotten about that one, but I think I’d only visited London a couple of times before I started my PhD in 1985. I had been planning to walk in along the Cromwell/Brompton Road from where I was staying with a friend, but was running late and therefore realised I’d have to take the tube. Of course the tube was closed because of the bomb, but had I been on schedule I’d have been walking past Harrods around when the bomb went off.